San Francisco’s fascinating history provides the setting for the rich architectural flavor of the Union Street area. Union Street follows the unpaved road which once linked the developing city with the Presidio. As San Francisco rapidly expanded during the Gold Rush, the area continued to prosper and to become more fashionable. Prominent San Franciscans settled here and erected impressive mansions in the 1860s and 1870s, built in the ornate Victorian style. Among the most famous houses was the Casebolt mansion at Union and Pierce, Mayor Ephraim Burr’s house at Filbert and Van Ness, and William McElroy’s Octagon House at Gough and Union. 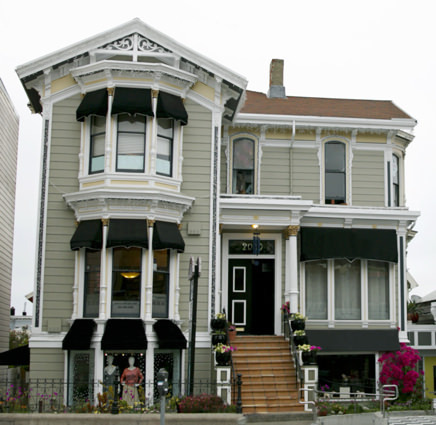 At 2040 Union, the center of present day Union Street, stands the farmhouse built by dairy rancher James Cudworth and at 1980 Union St. stand the two identical Victorian houses he erected as wedding presents for his two daughters. In 1891, the area was developing so rapidly that all livestock was ordered out of Cow Hollow and the lagoon was filled in to make way for houses. Cow Hollow became a residential area where distinguished, yet comparatively more austere, Edwardian-style homes were developed along side fanciful Victorian mansions. Fortunately, Cow Hollow sustained little damage in the earthquake and fire of 1906 so that the buildings of the area, preserved much as they were at the turn-of-the-century, can still be seen today. In the 1950’s Union Street emerged as one of the City’s most charming shopping districts where old Carriage houses, barns and Victorians—including the Cudworth Mansion and the Twin Wedding Houses—were carefully renovated to accommodate new stores and restaurants. Today, Union Street is one of San Francisco’s foremost shopping streets.